Over 228,890 people aged between 1 to 19 years have been immunised in the Central, Western and Northern divisions under the National Meningococcal Immunisation Program. The Immunisation Program also continues in the Eastern Division with 20,000 people being immunised. 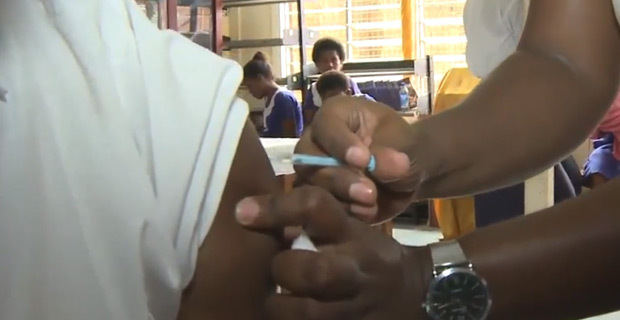 Minister for Health, Rosy Akbar has acknowledged all the nurses, community health workers, health staff, village leaders, teachers and communities who have been part of the National Meningococcal Immunisation Program. The Immunisations teams who have overcame the odds by braving the unexpected weather conditions to deliver the vaccines in the most remote locations have described their experience as challenging yet empowering. Sub-Divisional Medical Officer Tailevu, Dr Ilisapeci Lasaro has commended the team who aspired to reach out to some of the remote villages and settlements in Tailevu where they visited 31 primary schools and 7 secondary schools within Tailevu, with more than 9,707 children immunised. Principal Medical Officer Rakiraki Hospital, Dr Mere Vakawaletabua says that through team work, the Ra Immunisation team has been able to immunise over 10,000 children and have conducted the Immunisation in 39 primary schools and 7 secondary schools, including the boarding schools.